Douglas LaChance, who led the powerful union that represented New York City newspaper deliverers in the 1980s and ’90s and whose crafty, two-fisted approach led to a prison term on racketeering and extortion charges, died on Wednesday, in Long Beach, N.Y. He was 69. The cause was a heart attack, his son Ricky Lonergan said. Mr. LaChance was president of the Newspaper and Mail Deliverers’ Union when it represented drivers for 16 principal newspaper distributors in the New York metropolitan region as well as for New York City’s three principal newspapers: The New York Post, The Daily News and The New York Times. The competition for territory was bitter among the distributors, often infiltrated by professional criminals. After the failure of many New York newspapers in the preceding decades, Mr. LaChance focused on job security, including his own as a well-paid truck driver for The Times. His willingness to trade concessions in work rules for better wages and benefits and to make long-term deals won praise in 1992 from The Times’s publisher, Arthur O. Sulzberger Jr. Some of his union’s members, however, criticized Mr. LaChance’s willingness to sacrifice driver routes and jobs for financial security for those still employed. The deliverers’ union had more power than other newspaper unions because it controlled the only way the newspaper companies could get daily papers to readers quickly. Other unions had been weakened when newspaper managements figured out how to mechanize many tasks and assign managers to take over production jobs during strikes. Mr. LaChance, a big, man, used his negotiating skills to help himself as much as his members. In 1980, he was convicted on 124 counts of extortion and racketeering for demanding and receiving payoffs from newspapers and distributors. One count involved a concession he won from companies in which they would give $3,000 to each worker they laid off. He was convicted of keeping the money for himself. Mr. LaChance was also convicted of accepting payments from bigger distributors to foment labor unrest at smaller competitors. Still other counts detailed how he had demanded and received regular monthly payments from distributors. In all, he was convicted of accepting $330,000 in payoffs. 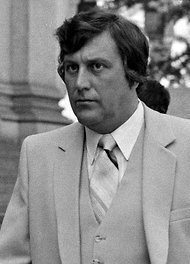 Mr. LaChance was union president from 1976 to 1980, when he resigned to go to prison on extortion, racketeering and other charges. After serving 55 months, he returned to driving his truck and working in the union. He was again elected president in 1991 and held the job until 1993, though he returned to prison for four months during that time after violating his parole by testing positive for cocaine. When Mr. LaChance was sentenced to 5 to 12 years in 1980, the judge said his offenses could have earned him a prison term of 1,200 years. Mr. LaChance began driving for The Times in 1959 and became union business agent in 1969. In 1985, a truck he was driving skidded off a bridge in Connecticut and fell 60 feet. His seat belt saved his life, he said, but he lost his spleen in surgery. In 1995, Mr. LaChance was acquitted of charges that he had threatened The New York Post with labor unrest if it did not hire Pelham News, a nonunion company, to deliver The Post to retail outlets. Mr. LaChance was alleged to have been a hidden owner of Pelham. In addition to his son Ricky, Mr. LaChance is survived by his longtime companion, Elizabeth Guarnieri; his daughters Sheri Ralph and Suzanne McCrosson; his sons Glenn LaChance and Corey Lonergan; a sister, Eileen Young; a brother, Gerald; and 12 grandchildren. Enemies may survive him as well. He told The Voice about the time the police asked him if he had any. “Try the Manhattan phone book,” he said.